If you are researching binaural beats, you might be wondering what the best headphones for binaural beats are. 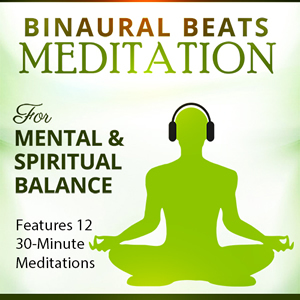 It makes sense that if you are going to listen to binaural beats on a regular basis, meditation programs for example, you will want to make sure you get a pair of headphones that will give you the best chance to get the most out of the sound recordings. 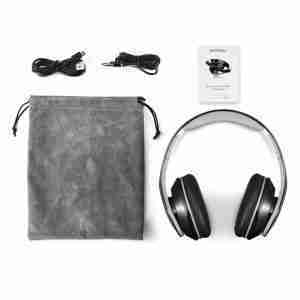 It might even be that you like your technology and want an opportunity to treat yourself to a quality pair of headphones to listen to your binaural beats. That’s perfectly okay but as you are buying for a particular reason, you need to consider some aspects of use. PS If you are in a rush and just want to get a decent pair, I think the best headphones for binaural beats under $40 in the USA are these Mpow Bluetooth Over Ear Headphones . You really don’t need to pay any more! If you are a UK binaural beats listener, see them by clicking here, although they seem to cost more in the UK! 2.1 #1 The best headphones for binaural beats do NOT automatically change or enhance the sound. 2.2 #2 The best headphones for binaural beats for you will depend on your environmental requirements. 3 So, what are the best headphones for binaural beats under $40? 4 What are the best earbuds for binaural beats? 5 Why not check out Sleep Headphones for binaural beats? Brand – they pick a brand they are familiar with and trust. These factors are, of course, great considerations if you are trying to narrow down the hundreds of headphones available, but there are other considerations too, especially depending on the end use you have in mind. To state the obvious, you probably wouldn’t wear your expensive professional quality DJ headphones while using your skateboard, and similarly, you wouldn’t use cheaply purchased earbuds in the studio. So, to my thinking, you should look for certain considerations when looking for the best headphones for binaural beats. If a pair meets the considerations, and your budget, great! #1 The best headphones for binaural beats do NOT automatically change or enhance the sound. You need to make sure that the headphones are not designed to give a big bass boost, or change the way the sound is meant to be heard in any way. Some headphones will attempt to smooth the output to achieve a desired preset. 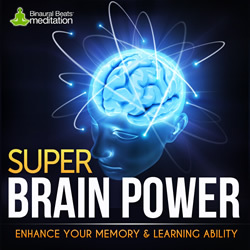 Binaural beats sound files are precisely engineered to deliver output to a specific frequency set to entrain your brain to a specific end. Headphones that change the output will affect the outcome and may partially or fully negate the entrainment. #2 The best headphones for binaural beats for you will depend on your environmental requirements. The type of environment you plan to listen to binaural beats in will affect your choice of the best headphones. You need to consider where you will listen and how important it is that you can be interrupted if required. For instance, you may listen while walking down busy streets or you may listen at home but need to be quickly available if the kids need you. Closed back headphones are probably preferable because they will provide you with a more immersive experience and block out distractions if you are in a noisy environment. 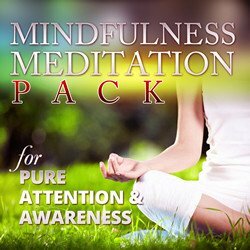 Without any outside distractions you may be able to better relax and keep focussed on the binaural beats track you are listening to. If you choose closed back headphones, you will then have a further choice to make between circumaural or on-ear types. The circumaural types are bigger and will sit over your ears whereas the on-ear types have smaller cups and sit on your ears. Obviously, then, you will choose on-ear type headphones if you value portability and plan to take your headphones with you on the move. 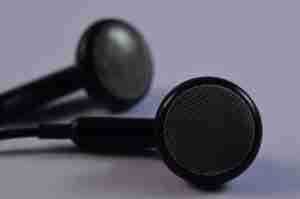 Open back headphones, as the name suggests, do not fully encompass your ears so can allow some noise intrusion. But if you are not in a position where you can totally switch off, they are still a choice for your brainwave entrainment. If you are considering a pair of headphones to listen to binaural beats it’s worth checking out the frequency range, which is measured in hertz. The headphones will deliver more bass at lower hertz so headphones starting at 15hz headphones will be more “bassy” than those starting at 25hz. That said, I believe that our ears cannot hear below 20hz, so that is the practical minimum. The upper limit of our hearing range is 20Khz so again there is a practical upper limit, although headphones don’t need to reach this high frequency to be effective. So as long as your headphones work within in this range they should be absolutely fine for the purpose of listening to binaural beats. The majority of popular headphones seem to operate between 18hz and 18kwh. 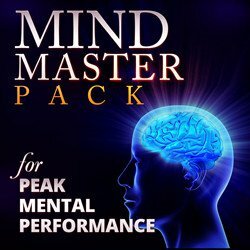 If you are going to be using headphones to listen to binaural beats you do not want to suffer any discomfort that will distract you from your goal. It may be that you are meditating or trying to focus on the binaural tones within the sound recording. But if the headphones are tight or not well padded and rub on your head, they will not meet this criteria. You will then need to buy headphones that have a reasonable amount of padding for your ear, and can also be adjusted to the size of your head. After all, we’re all different. So, what are the best headphones for binaural beats under $40? At this stage, you might be expecting me to recommend a really expensive pair of headphones. But I’m not going to. The truth is, that to get the benefits of binaural beats recordings, and also meet the four criteria, you can spend less than $40 (at the time of writing this review). You can, of course spend more if you want to! If you love your tech, then by all means go for a higher priced pair but make sure they meet the four criteria listed above, and any that you may add in yourself. 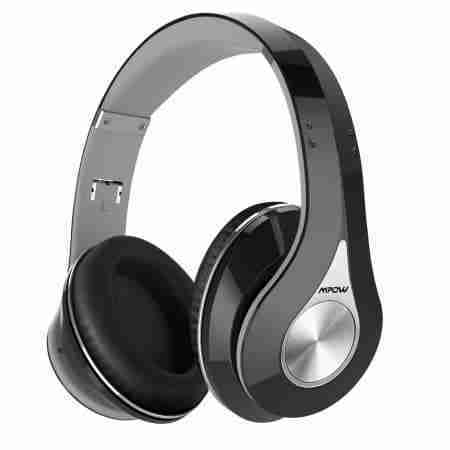 So, my recommendation for the best headphones for binaural beats are these Mpow Bluetooth Over Ear Headphones. These are a pair of lightweight closed back over ear dynamic stereo headphones. The sealed design gives good insulation against background environmental noise so you can listen to your binaural beats without interruption. They use passive noise cancellation, not active, so please bear in mind that they will not cancel out background noise more than active canceling headphones if that’s one of your criteria. But with finely tuned drivers they deliver a crisp, finely balanced sound for all types of audio so they will be great for your day to day music listening too. They use a memory protein ear cushion which feels like your skin so should remain confortable during use. Foldable, they provide a portability so that you should be able to take them with you wherever you go. One further advantage over other value headphones is that they have bluetooth built in so there’s no fussing with wires. The built in battery lasts about 13 hours and there is an option to use a wire with them if you find yourself out of battery any time. I hadn’t heard of Mpow before I did this research but I’m generally a fan of user reviews and these headphones do well in reviews by users, averaging 4.6 out of 5 in 619 reviews at the time of writing. There were also over 111 questions so if you have one, it’s probably already been asked and answered here! I’m not an audio engineer so conduct your own research, but they seem to meet the four considerations. 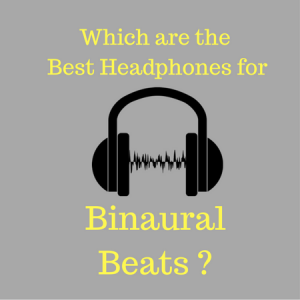 What are the best earbuds for binaural beats? Finally, in case you are someone who can’t use headphones, you might need to consider earbuds. It may be that you wear glasses, for instance, and headphones can be a bit painful to wear. Or you just may not like the size of them and want headphones that are more portable. That’s not a problem because you can get just as much benefits from binaural beats by listening through earbuds than headphones. You just won’t get the immersive feeling of headphones and loud noises may distract you a little. To choose the beat earbuds for binaural beats, just go through the four criteria listed above and apply them to your favourite brand of earbuds at a price range you want to meet. If they meet the criteria, go for it! My simple recommendation is again a low cost one because I know not everyone has the money for expensive earbuds and, why pay more than you need to? You can get relatively expensive earbuds by manufacturers such as Shure, but I think Taotronics generally make a good value range of earbuds that seem to sell really well. Click here to see the range..
Or click here if you are a consumer in the UK..
Why not check out Sleep Headphones for binaural beats? I must admit that I haven’t used any sleep headphones, sometimes called sleepphones. 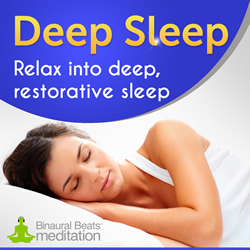 But it seems a great idea to me, particularly if you are listening to binaural beats to help you sleep. They are a band that wraps around the head with speakers in that are often very thin and ideal for lying down in. I’ve read that some people pull them down a bit and can use them as a sleep mask as well. Sleepphones in the USA or Sleepphones in the UK. I hope you enjoyed my review of the best headphones for binaural beats. If you did, leave a message – I’d love to hear from you. A like to the Facebook would be really appreciated.